Moving your whole army perpendicular from the opposing forces until they form an arc, then hitting 'Hold Position'. Boxing and spreading units manually. Is there an easier way, maybe with multiple control groups and/or hold/patrol commands? How are the top players forming their arcs? The reason I use "Hold" to form my arcs is because a line is formed when you run your units as far as their sizes combined. If you simply 'Move' to the position, you will bunch up into a ball. I guess I can try 'Stop' for this instead like has been suggested, but what I'm really hoping for is more along the lines of Budda's answer of using 3 control groups (maybe even pre-split with N marauders, N marines, and N/4 medivacs). I'm going to leave the question open for a little while longer just to make sure we're not missing anything. Sadly, it appears that positioning units manually is the best arc forming method. I still find myself using patrol to send units north, shift-move them just a few steps south of the north rally point, and then shift-move to where I want to go (further north in this example) to get a better arc (YMMV). I chose the more general answer even though I may have liked the other answer better because I think it will better fit users coming in from Google. Thanks again. "Hold position" actually is a generally bad thing for forming arcs. Your units will automatically move to form an arc when engaging in a fight. A simple example is attacking destructible rocks. When you attack them, your army automatically arcs around the rocks. You will see units automatically stop and attack as soon as they are in range of the rocks. Units that are out of range and are blocked by other attacking units will sort of "peel" off the back layer into the edges of the arc shape. Keep them in a line roughly in the shape of the arc. It can be very approximate. "Holes" in this line are a good thing, so units in the back can filter easily to the front without having to move far. Units with less range go in the front. Melee units especially... watch a Protoss battle where zealots are behind stalkers and you'll see how worthless they are (and if Protoss has blink, he will often blink stalkers behind the zealots at the start of an engagement). If you have blink stalkers, you can blink some stalkers to the side a bit to form an instant arc. if you didn't make an arc before the battle and opponent is approaching, try to get your army back in 3 different directions. For example: on the "Shared Temple" map you have your army in the center (close to XelNaga tower). You detected that opponent is approaching from North. Get part of your (1/3) army move left, another part (1/3) move right. When opponent came into combat with 3rd part (that stays in original place) - move them down. Opponent will try to catch you. Immediately when you pulled your remaining forces down. get all other parts to back center (attack command). last item - get back to center your part that moved down. 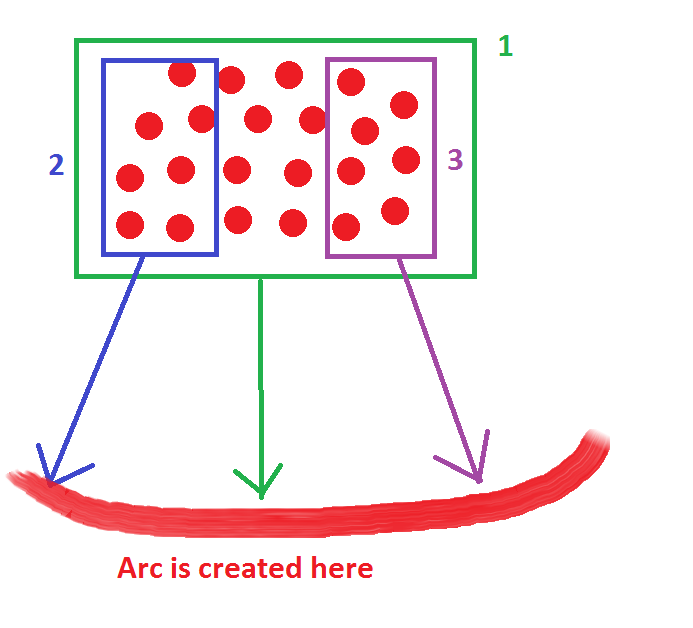 As a result you will form if not a circle, then at least a pretty good arc. for sure, that requires a solid micro. But result could be awesome. The easiest way to form an arc during or before a battle is to retreat. It is best if you retreat while the enemy is approaching but before he is in reach to shoot you. While you retreat select all your units to go back to some position (step 1). Then select a subgroup (step 2) and make them move next to your selected position. Repeat this as many times as possible (step 3). After you are done with this and you enemy closes in, select your arc and attack move into his army. Your arc will fan out even better and way faster than your opponents. The concept is very similar to spreading your units. To counter this as the aggressor just stop advancing and pull back or retreat yourself doing this. If he attacks with an arc and you are far away his units will clump up again. In Warcraft 3 this was referred to as "gosu dancing", but you rarely see this done more than once or twice in Starcraft. Not the answer you're looking for? Browse other questions tagged starcraft-2 or ask your own question. Fully random maps in SC2? Why is it always better to attack with a concave, even for equal units? How to counter marine rush as a protoss on maps with huge ramps like Scrap Station? How to deal with 2v2 rushes? What is the best way to pick off banelings with zerglings? SC2 camera positioning easy way?